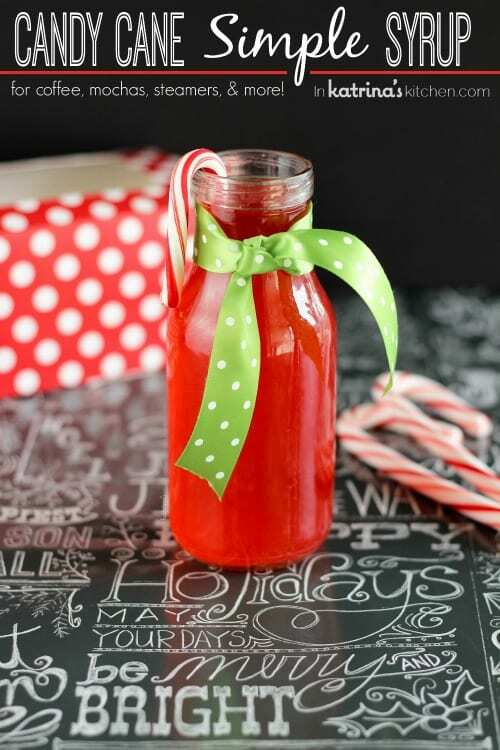 This sweet peppermint simple syrup gets its flavor from candy canes. Forget spending all your money on expensive coffee syrups. It’s also perfect for holiday giving! It is my holiday siren. Resistance is futile. Cookies, cakes, frosting, even candles and handsoap- BRING IT ON! But especially coffee. Peppermint belongs in my coffee. I love making simple syrups at home partly because when the urge arises I NEED flavored coffee right now, but mostly because I’m cheap. I like a lot of flavor in my coffee and can go through a tiny bottle in an embarrassingly short amount of time. 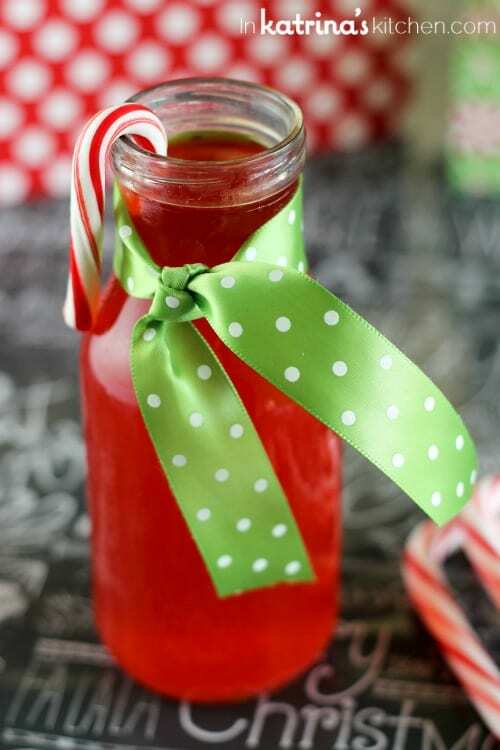 I have made peppermint simple syrup with peppermint extract before and I love the results (I will include that in the recipe below as well) but I thought of this fun and inexpensive alternative and I just had to share with you. If you aren’t turning out peppermint baked goods at an alarming rate like some people (ahem), then you may not have much motivation for buying a $5 bottle of peppermint extract just so you can make your own coffee syrup at home. But I’m willing to bet you have a $1 box of candy canes lying around this time of year. You are going to unwrap those candy canes and throw them in some water and boil them down into a delicious syrup for your coffee, mochas, frappuchinos, and whatever else your little heart desires. I found that a 12:1 ratio worked best for my tastes and I didn’t need to add any sugar. Tweak the recipe as needed to your liking. Also this is best prepared in advance as it gives the flavor time to deepen but none will be the wiser if you sneak a few Tablespoons immediately. 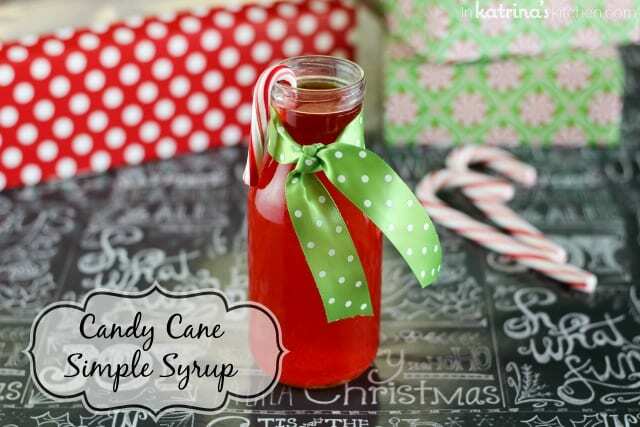 This sweet peppermint simple syrup gets its flavor from candy canes. Forget spending all your money on expensive coffee syrups. It's also perfect for holiday giving! Unwrap candy canes and place in a pot with 1 cup water. Remove from heat and continue stirring until candy is dissolved completely. Let cool and store refrigerated for up to 1 week. Best if chilled overnight but can be used immediately. I like to add 2-3 Tablespoons to my coffee. This can me made in the microwave but you must use caution and use a microwave-safe glass dish (I recommend Pyrex). If you would like a stronger flavor you can add up to 1 teaspoon of peppermint extract (found in the baking aisle by the vanilla extract). Alternatively if you would like to only use peppermint extract and not candy canes you can use this ratio: 1 cup water, 1 cup sugar, 1 t peppermint extract. 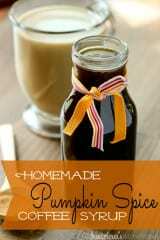 If you like this you might want to try my Pumpkin Spice Coffee Syrup as well! What a perfectly fun gift this would be! I would love someone to give it to me:) What size candy canes did you use? Great question, Sue! Standard size candy canes (5 1/2 inches). I updated the post to reflect that so thanks for asking. Love this idea. It is genius. Totally trying it this weekend. Pinned! I love this idea 🙂 will definitely have to use this asap! Peppermint awesomeness for sure here!!! I am kind of obsessed with peppermint everything right now and I love how easy this is!!! Thank you Jocelyn! What is it about peppermint? I just can’t say no! What! This is such a good idea. You’re a genius! Nothing says Christmas quite like peppermint. This would be great for hot chocolate. Ha! Thanks! It was so great in hot chocolate. I hope you try some! I made this over the weekend, after a few adjustments. I only had mini candy canes so I used 60! I also ground them up in my food processor, which left me with about 200 grams. That made the cooking part realy easy. My only complaint is the colour. There was green in the candy canes, so it came out a grey burgundy colour. Where did you get the super cute containers? this is perhaps an odd question but have you used this simple syrup in a cocktail? I want to make peppermint martinis and I wanted to make a simple syrup instead of store bought stuff. I’m writing from the Philippines and I thank you for unselfishly sharing your recipe and ideas with the world. My husband and I are into flavored coffee as well. I spend about $8 equivalent for a 750ml bottle of syrup which we consume in 2 weeks (at 3 pumps of per coffee cup). I just arrived from LA but before my trip I checked Amazon for peppermint syrup. I discovered crushed candy cane. A 5lbs bag cost $39. This will go a long way using your recipe. I hope your viewers will benefit from this piece of information as well. Again, thank you and more power. Yum! I hear you girl. All peppermint, all December. Thanks for sharing your outstanding recipe. Added to half hot chocolate and half coffee makes a delicious drink.